After the surprising success of Pride and Prejudice and Zombies (which I read last year and enjoyed quite a bit) there have been several more of these unlikely marriages of literary classics with zombies, vampires, etc inserted into the original text (the latest I’ve seen, but not read, is a vampire version of Wuthering Heights, which probably explains a lot about Heathcliff). 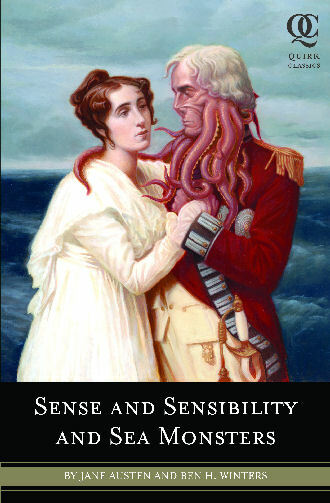 Sense and Sensibility and Sea Monsters had some amusing moments, but I didn’t find it as genuinely fresh and fun as PP&Z. The title really tells you everything you need to know, and the picture of Austen’s England ravaged by every imaginable kind of sea-monster and vicious ocean creature (with pirates thrown in for good measure) does provide a few chuckles. But overall, my main feeling during this book was the desire to go back and reread Sense and Sensibility without all the interpolations. Maybe the classic/monster mash-up is the kind of idea that really only works well once. I chuckled when I read PP&Z, but that was enough for me. I saw SS&SM but didn’t grab it up. I must say, however, that high school students who are “required” to read these classics LOVE the “unlikely marriages”. I saw that vampires have also taken over LITTLE WOMEN. I thought Edward of TWILIGHT fame had some Laurie in him! I just can’t do it, Trudy! I’ve looked at these (having read DOZENS of Austen sequels and knock offs ranging from the sublime to the ridiculous), but I just can’t bring myself to read them. Not sure if it’s what you intended, but your post validated my decision!